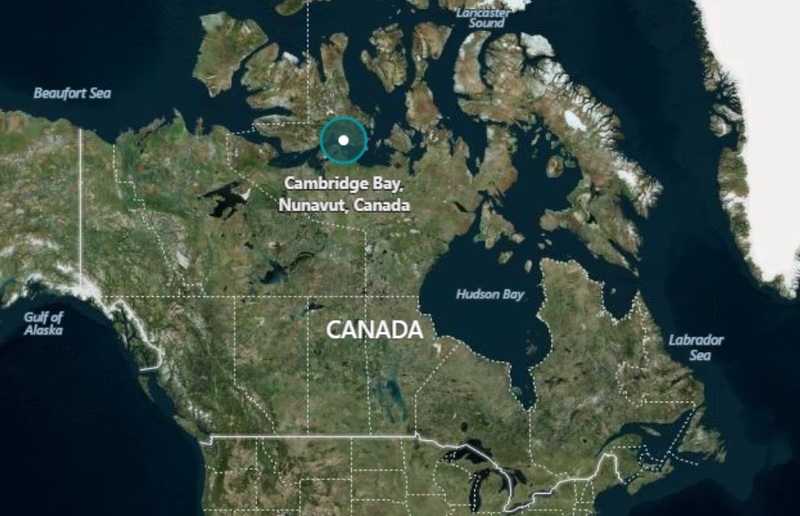 Unseasonably warm temperatures over the past weekend saw people in the western Nunavut hub of Cambridge Bay heading out to their cabins or the beach, where some even dipped into the Arctic Ocean to cool off. However, it wasn't so long ago-for example, in 1974, according to Environment Canada-that you could expect to find snow on the ground at this time of year. Recently, temperatures have been rising 10 degrees or more above normal ranges for this time of year in Nunavut's Kitikmeot region and the High Arctic islands, where the weekend's heat wave broke Environment Canada records. Cambridge Bay's high temperature of 22 C on Aug. 11 broke the previous high temperature of 20.5 C for that day, recorded in 2013. Temperatures remained warm in Cambridge Bay throughout the weekend-21.6 C on Aug. 12 (breaking the previous high of 21.4 C from 2013) and on Aug. 13, when the high reached 21.9 C (breaking the previous high of 18.9 C set in 1949). Taloyoak's high of of 21.8 C and Kugaaruk's high of 22.8 C on Aug. 12 also broke records for the day. Kugaaruk's even-warmer high of 24.3 C on Aug. 13 then broke the previous high record temperature of 21 C, set on that date in 1985. Kugluktuk also saw a high, but not record-breaking, temperature of 26.6 C on Aug. 10-with more warmth, and a high of 21 C predicted by Environment Canada for Aug. 14. Pond Inlet and Arctic Bay, with temperatures of 18.3 C and 18.4 C respectively, on Aug. 13, also broke previous recorded temperatures for that date. Today Iqaluit is also set to enjoy some above-average temperatures, with Environment Canada forecasting a high of 16 C-six degrees above the usual 10 C temperature for Aug. 14. Such warm Arctic temperatures reflect recent findings in the 2016 State of the Environment, the annual summary of the global climate, from the American Meteorological Society, released Aug. 11, that says the Arctic is "is warming at more than twice the rate of lower latitudes." In 2016, the average temperature of land surfaces north of 60 was two degrees Celcius above the 1981 to 2010 average, breaking the previous record of 2007, 2011, and 2015 by 0.8 C, the report said. That represents a 3.5 C increase since record-keeping began in 1900, said the report, which includes a special section on the Arctic. "Rapid change is occurring throughout the Arctic environmental system," the report said, with many signals indicating that the "Arctic environment continues to be influenced by long-term upward trends in air temperature."